Where can you Enjoy Camping Near Athens, AL? Camping is a popular activity near in the Athens area of Alabama. You’ll always see locals enjoying the outdoors, check out trails, going fishing and spending quality time with their loved ones outside. For those that have an RV and want to campout, there are some spots that are designed for RV camping. Here is a look at a few of the tops spots in the area and what amenities they offer while camping. Just 8 miles west of I-65 exit 361 in Elkmont, the Mill Creek Park is the perfect place to bring your RV and large groups. There is a pavilion that seats 60 and has a full kitchen for your special event. Along with scenic views, this park offers RV pull-through hookups and creek side camping. The Cowford Campground is one of the most popular campsites in the area. It’s located on the Tennessee River and they offer shaded campsites, well-groomed areas and amenities for your RV. You’ll find pull-through areas for RVs, graveled and level with water, sewer and 30/50 amp electric as well as great amenities. Enjoy the sandy beach area with boat launches and a floating pier, swimming, fishing and a climate controlled bathhouse and laundry room. Another great choice is the Sportsman’s Park. They offer 23 RV camp sites, showers for campers and picnic tables. In the summer you can enjoy the group cookout on Thursday nights. There is also a boat dock for launching and fishing. 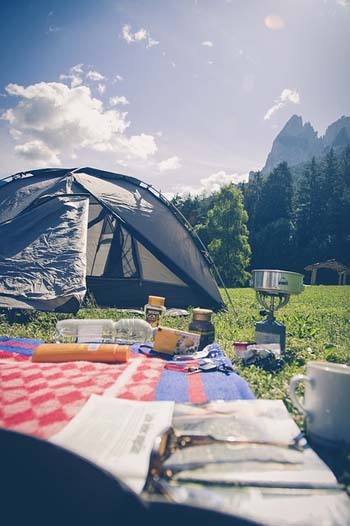 Finally, check out campsites including the Swan Creek Park in Tanner, Lucy’s Branch in Athens on Elk River, Billy Bard’s Court and Northgate RV Travel Park for the best camping experience and so much to enjoy for the whole family.